Joan Allen (The Bourne Legacy) and Anthony La Paglia (Without a Trace) will play Darcy and Bob Anderson with Kristen Connelly (House of Cards) playing their daughter Petra. През октомври започват да снимат филм по новелата A Good Marriage (Щастлив брак), главната роля е поверена на Joan Allen (Face/Off, The Bourne Ultimatum, The Bourne Supremacy, Death Race). Екранизацията на A Good Marriage ще бъде по сценарий на Кинг! 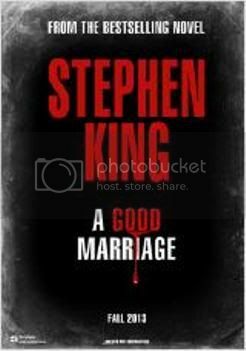 Atlas International has added Stephen King adaptation A Good Marriage to its Cannes slate. Peter Askin will direct the psychological thriller based on a short story from King’s book Full Dark - No Stars, winner of the 2010 Bram Stoker Award for Best Collection. Will Battersby produces. A Good Marriage follows a woman who discovers her husband’s dark secret hiding in their garage. The New York shoot is set to get underway in late summer for a summer 2013 release. Joan Allen will star in A Good Marriage, an adaptation of a Stephen King novella. Peter Askin, who directed the 2007 documentary about the Hollywood Blacklist and McCarthyism titled Trumbo, is on board to helm the thriller and is producing with his Reno Productions partner Will Battersby. King’s story, which appeared as part of the author’s Full Dark, No Stars short story collection published in 2010, centers on a woman named Darcy who discovers the sinister and gruesome double life that her husband of 25 years and father of their two children has been living. She must now decide how far she is willing to go to maintain the marriage. Those familiar with the tale know that the role offers plenty to chew on, calling on a range of chops, both figurative and literal (sorry, couldn’t resist). King wrote the screenplay for the movie, which is being financed by independent equity. Paradigm is handling domestic rights, while Atlas International is selling foreign rights. King and Askin are old friends, with Askin directing a stage production of Ghost Brothers of Darkland County, a musical written by King with music by John Mellencamp. It debuted in Atlanta this year. Production on Marriage is due to start in New York in mid-October. The award-winning Allen, repped by ICM and attorney J. Franklin Stewart, most recently reprised her role of CIA director Pam Landy in The Bourne Legacy and was one of the stars of HBO’s Luck. Askin, who also directed the indie drama Searching for Certainty, is repped by CAA. It's been nearly a year since there was anything to talk about regarding the latest Stephen King adaptation heading our way, A Good Marriage, but word has come that production is getting under way at the end of May in Sleepy Hollow, NY, with a 15-day shoot scheduled at a local home. Joan Allen will star in the adaptation of the Stephen King novella, which was featured in Full Dark No Stars. Peter Askin, who directed the 2007 documentary about the Hollywood Blacklist and McCarthyism titled Trumbo, is on board to helm the thriller and is producing with his Reno Productions partner Will Battersby. King’s story centers on a woman named Darcy who discovers the sinister and gruesome double life that her husband of 25 years and father of their two children has been living. She must now decide how far she is willing to go to maintain the marriage. King wrote the screenplay for the movie, which is being financed by independent equity. Paradigm is handling domestic rights, while Atlas International is selling foreign rights. Новелата е добра, струва ми се, че ако в екранизацията се наблегне на психическите състояние на героите - как те постепенно се сриват (най-вече съпругата на главния герой) ще се получи доста сполучлив трилър. Дано. Rising actor Theo Stockman (“30 Rock,” American Idiot) has joined Joan Allen and Anthony LaPaglia in A Good Marriage, the indie adaptation of Stephen King’s 2010 novella, says THR. The movie, currently in production, is being directed by Peter Askin and sees Allen play a woman named Darcy, who discovers the sinister and gruesome double life that her husband and the father of their two children, played by LaPaglia, has been living. Stockman is playing their son, a man who made a name for himself in the advertising world and is enjoying his newfound success.